This forecast was published 04/15/2019 at 6:58 AM. 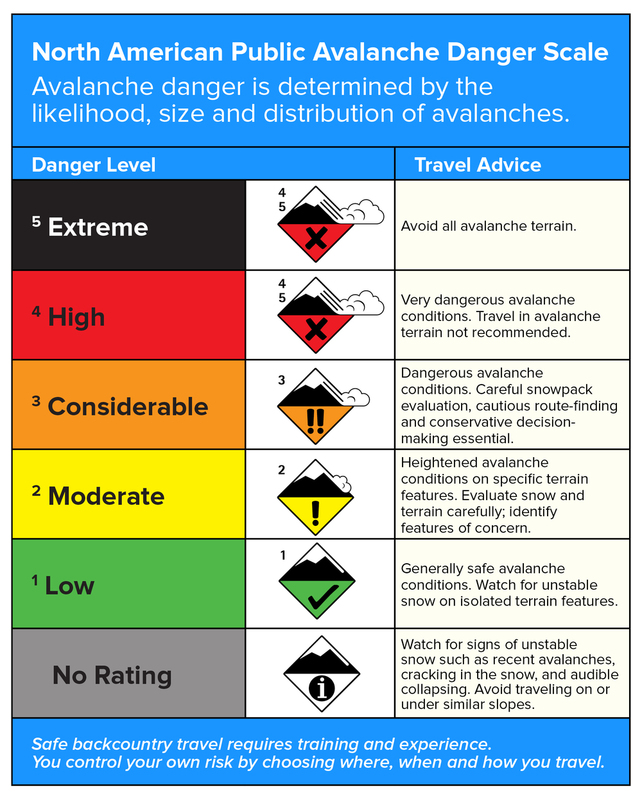 This is an archived avalanche forecast and expired on 04/15/2019 at midnight. 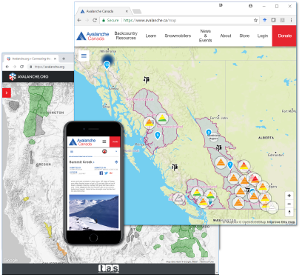 Rain and above freezing temperatures are continuing to create conditions for wet avalanches while also making the spring hazards of icefall and undermined snow relevant today. Wet loose sluff avalanches are possible to initiate under your skis or snowboard, especially in areas that were not heavily skied over the weekend. While difficult to predict, conditions allowing deeper wet slab avalanches may develop today. These are unlikely but should motivate you to minimize time spent in the runout of steep terrain, as should possible icefall in much of the same terrain. Streams flowing under the snow are actively opening new melt holes, and the possibility of breaking through a thin snow bridge should keep you on your toes in any drainage or where you hear water flowing. 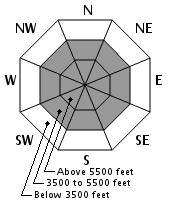 All forecast areas have LOW avalanche danger today. Remember the possibility of potentially unstable snow, and also manage the emerging spring hazards. 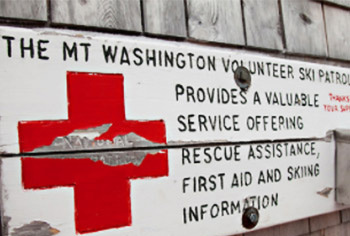 It’s a rainy day all the way to the summit of Mount Washington, where ¼” of rain was recorded last night and another ½” to ¾” is expected today. Temperatures briefly dipped below freezing on the summit early yesterday, but otherwise above freezing temperatures have been affecting our snowpack since Friday. 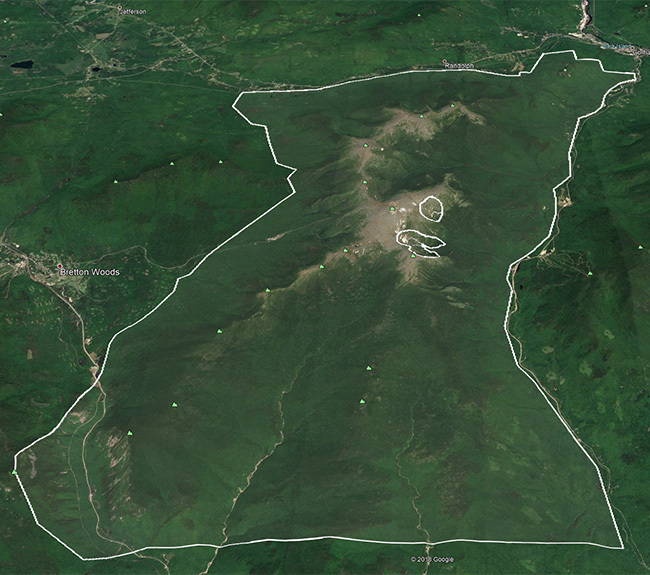 High temperatures in the upper 40sF are expected throughout our terrain. Tonight should bring a return to wintry conditions, with precipitation transitioning to snow this evening and NW wind ramping up towards sustained 100 mph speeds through the night. Snowfall may total 1-3” tonight and another trace-2” tomorrow morning. Tomorrow’s forecast calls for temperatures below freezing in our middle and upper elevation terrain, with snowfall tapering off but clouds remaining and wind diminishing slightly. Wet loose avalanches remain easy to initiate under skis or board in steep terrain that saw minimal traffic over the weekend, and are possible throughout our middle and upper elevation forecast areas. Keep in mind the potential consequence of being knocked off your feet and pulled downhill by these heavy, wet sluffs that typically initiate below your feet but could pull you towards hazards down slope. Wet slab avalanches are unlikely but not impossible today, with rain driving the strongest warming of our upper snowpack in recent days. 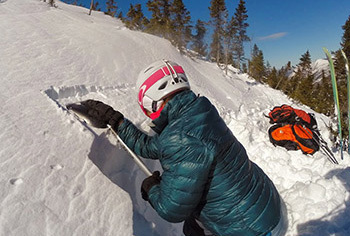 The chance of water pooling, flowing, or otherwise helping form a weak layer well below the snow surface on all middle and upper elevation aspects should motivate you to continue treating avalanche terrain and runout areas with respect. Warming and wetting have been the dominant weather affects on our snowpack since late last week. Snow temperatures of 32F, which it’s worth remembering is quite warm for snow, were recorded at three feet below the snow surface on Saturday and this warming has only penetrated deeper since. Rain today is driving the most rapid melt our snowpack has yet experienced this week, or really this spring. Wet avalanches during prolonged warming events are particularly tricky to forecast. While we don’t have specific weak layers of concern, it’s possible for percolating meltwater to collect and flow on any number of buried crusts and create the conditions for a wet slab avalanche. This is scenario is unlikely but should be considered if you’re in avalanche terrain today. Wet loose avalanches will be more likely and should be relatively easy to initiate in steep terrain, especially anywhere that saw minimal skier traffic over the weekend. Posted 04/15/2019 at 6:58 AM.